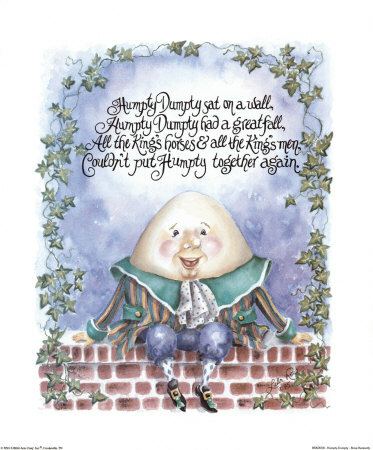 Ok you all know the poem, so I ask you that where in the poem does it say that Humpty Dumpty is an egg? It doesn’t. It’s not even implied. There is no reference to the fact that the common perception of Humpty Dumpty is an uncooked chicken embryo. This is probably the first real assumption that you’re taught. So this precipitates the ability, even from a young age, that assumptions good and bad can be accepted as fact. Is there any evidence whatsoever? No there isn’t because the imagery that accompanies this poem is always that of an egg. While this poem could be perceived as a metaphor, such as the fall of Richard III for example, this nursery rhyme is aimed at children about to enter school for the first time, (Ok we all know the nursery rhyme The Grand Old Duke of York is about Richard III), and thus pertain towards assumption without evidence from a young age.